Issue #177 • April 8, 2013•Sold Out! There was a messenger who was stuck working for a no-good king. That the king was no good had been proved by numerous studies. His intentions may have been good, but results-wise, he was not good. The delivery of kingly services to subject/consumers had grown markedly less efficient since the death of the old king. Also, the new king was not really handsome enough to be a king. He was duke material at best, according to the studies. For a distinguished messenger nearing the end of his career, it was embarrassing to be working for so mediocre a king. Whenever the messenger told people about the dozens of professional awards he had won over the years, he made sure to emphasize that he had won them in the service of the old king. Sometimes he grew misty-eyed at the thought of the good old days. How proud he had been, once upon a time, to rap upon doors across the land and say, “Message from the king!” How handsome he had felt, and how efficient, working for so handsome and efficient a king. How certain he had been that his work mattered, that he was helping nudge society ever so slightly forward. Douglas Watson’s first book, a collection of stories called The Era of Not Quite, won the BOA Editions Short Fiction Prize and will be published by BOA on May 14. His fiction has appeared or is forthcoming in Ecotone, Fifty-two Stories, Tin House Flash Fridays, Salt Hill, Sou’wester, The Journal, and other publications. His story “Life on the Moon” was chosen by Dan Chaon and Wigleaf in 2012 as one of the year’s 50 best very short fictions. He holds an MFA in creative writing from Ohio State University and an MA in history from Brown University. He lives in Brooklyn and works at Time magazine. WA: Where did the idea for this story come from? DW: I couldn’t tell you. One day at a café in Columbus, Ohio, I just started typing a bunch of sentences about a king’s messenger. I was just riffing, really, which is how a story usually begins for me. Often I come up with the title first, or else I write a first sentence and go on from there to the second sentence, and so on. You can eventually write a million sentences by this method. I’m pretty clueless when I’m writing a first draft. You sort of feel your way in the dark, or maybe it isn’t dark but you happen to be a creature with no eyes. In other words, it’s difficult. Later, once you have a draft to work with, you can try to figure out what the story is really about. DW: Getting the ending right. I could feel that there was this biggish thing I wanted to say, this thing that was sort of hovering at the edge of my vision. (I guess I did have eyes.) Figuring out how to put it into words really mattered to me—which is funny, I guess, in light of the story’s final lines. Anyway, once I had the ending, I had to go back and try to make the first part of the story worthy of the ending. WA: I love the way narrative distance is used in this story. As readers, we’re invited to care deeply about the king’s messenger even as we’re being reminded that he’s “just a character in a story.” Could you talk about the effect of that tension? DW: I always have that kind of double consciousness in my writing. I think it’s a way of trying to fold my own self-consciousness about the act of writing into the product itself—you know, like: Now add three tablespoons of self-consciousness. Beat until almost smooth. Melt the protagonist over medium heat. Add a dash of conflict and just enough sugar to make the reader care about the character. Mix well and bake for a million years in the Oven of Remember, This Whole Thing Is Kind of a Joke! Let cool before serving. What the effect of this is, I’m not sure. I hope that it’s part of the fun for the reader. When I write in that mode—the playful omniscient narrator looking down from way, way up high somewhere—I can get into a kind of capriciousness that I really like. You can be at once good-humored and cruel, which is a combination I enjoy. But also I think it’s a way of expressing something that’s true: We may really, really care about this character, this story, this life we happen to be living, but we know perfectly well that none of it matters in any ultimate sense. WA: As the narrator says partway through the story, “But this is not a love story. It is a philosophical story with a surprise ending.” Did you have the ending in mind all along, or did it come to you later on? 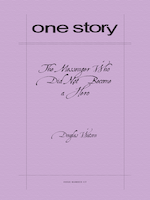 DW: I groped my way to that ending as I wrote the first draft of the story. Then I went back and, over the course of many subsequent drafts, tried to shape the story into something that could deliver the reader to that ending. In fact, the lines you’re quoting here were added, I think, in a later draft. Though I’m not completely sure about that. WA: Do you, as author, share the narrator’s belief that this is a “philosophical story”? DW: Let me tell you a story. Once there was a recent high school graduate. His hair was a mess and so were his thoughts. He was perfect for college, in other words. So there he was, at college, thinking he would major in philosophy. The trouble was, the more philosophy he read, the less he liked philosophy. He couldn’t believe all these philosophers really believed what they were saying. It seemed more like a competition to see whose footwork was the fanciest. It had nothing to do with life or the world. Later, after he has majored in some other subject and graduated and gotten a haircut, that same person still feels an urge to philosophize, but it’s an urge he can’t take too seriously. The moment you begin taking your own late-night philosophical musings seriously, you are lost, is one of the things he learned in college. So, no, the “Messenger” story isn’t a philosophical story. Absolutely not. Of course, all of this could have turned out quite differently if the guy had taken different philosophy courses, read better philosophers. WA: Aside from helping you to produce very well-copyedited stories, has your job as a copy editor at Time influenced your work in other ways? DW: The work I do at Time—I’ve been there five years now—has sharpened my writing at the sentence level. No question. Copyediting other people’s writing is good for a writer; it’s like practicing scales if you’re a musician. At the same time, you have to be able to turn off your editor brain, at least to an extent, if you’re going to have any chance at all of writing your way to page two of a story. So it can be a challenge. Editing is like arranging the furniture in a room, but first you have to build the house. Of course I will lose thousands of hours of sleep over this, but in the end I suppose it’s fitting. I’d rather be an ironist than a copy editor anyway. Hmm, I don’t believe I answered any of your copyediting—copy-editing?—questions. DW: I wrote a number of drafts over a three-year period. And, you know, in between drafts of this story I worked on other stories. By the end of three years, I basically had the story, although I kept tinkering with it in the succeeding months. All in all, I have eleven drafts of it. Sometimes I ask myself: Are you misspending your life? WA: How long did it take you to complete the title? DW: A hundred years. World War I had a lot to do with it. Who wanted to be a hero in that war? Nobody, there was no such thing. Aw, I’m just kidding, I never thought about World War I in connection with this story. DW: Well, last year I completed my first novel. It’s about love and death, which were the only subjects I could think of. More specifically, it is about a moody fellow named Moody Fellow. Things go about as well for him as you might expect. So my agent is shopping that novel around. Since then I’ve been working on a new story or two and have also taken some early stabs at a few new novel ideas, one of which I think has legs, though I’m not sure why I think that. I’m trying not to stab it in the legs, of course. It’s a bit freer and more experimental than the other novel. Now that I know I can write a novel, I feel a bit more confident about playing around with the form. That’s one of the main reasons I write, by the way: to play, to have fun. You’re not really supposed to have fun as an adult, but if you say, “I’m working on a novel,” people furrow their brows and nod and imagine you scaling some great height, without a rope, under a baking sun. And, sure, writing is a little bit like that, but it can also be a little bit like playtime when you were a kid. Kids love to make things up, after all; they’re natural fiction writers. But we can’t pay them to write stories. Child-labor laws forbid it. That’s where adult fiction writers come in. DW: I like Goethe’s admonition: “Do not hurry. Do not rest.” I don’t know if he had writing in mind when he said that or if he was just talking about how to live well. Maybe he was training for a half-marathon, I don’t know. In any case, it is very good advice for a writer.